Pizza has been the main course for many parties, ceremonies, and celebrations. When you think of fun food you can always put pizza at the top of the chart. The colorful delicious toppings on a pizza and pulling a slice away while watching the cheese stretch form the other slices makes pizza an art. But that’s not the pizza art we are talking about. Most pizzas come in a cardboard box. Usually it’s advertising the establishment you bought it from. If you think outside the box, the box becomes an open canvas, waiting for someone to draw on. Pizza art has made strides in a very short amount of time. A trend going around pizzerias are fun drawings or messages. At Cottage Inn we care about our customers. 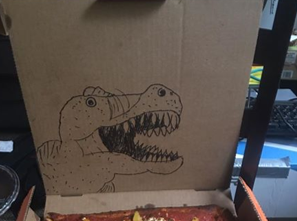 Whether that be extra cheese, no mushrooms, or a dinosaur drawn on your pizza box. 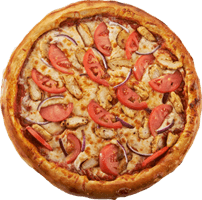 Cottage Inn strives to deliver quality gourmet pizza, but we also strive to make the experience for our customers fun and enjoyable. After leaving a Cottage Inn we want to give you something you can talk about, besides the delicious pizza itself.